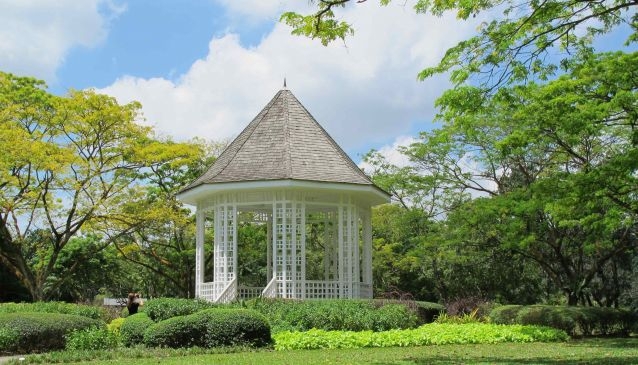 Located in the Dempsey area, The Singapore Botanic Gardens is a vibrant monument to the founding fathers of Singapore. As a botanical institution, tourist destination and regional park, the gardens play an important role in educational outreach, horticulture and botanical research and training.Furthermore, with several seasonal tours and events, the gardens are a must-see for any outdoor aficianados and science advocates. Inside the gardens themselves there is an information centre, a souvernir shop (also selling books and plants) as well as a lovely and very popular cafe-restaurant. With several more delicious food options on-site you'll be able to choose from classic Italian, French or local cuisine. Just for children is the Jacob Ballas Children's Garden, located within the Botanic Gardens themselves. Their Kidz Café offers light snacks and beverages for children's smaller appetites. Inside, children will have fun in the water play area, on the slides of the tree top house and on the suspension bridge with the nearby waterfall. Its a lovely outing for families. Please note that adults without children or children without adults are not permitted inside the Jacob Ballas Children's Garden. There is no admission fee for the Botanic or the Jacob Ballas Children's Garden. The National Orchid Garden costs S$5 for Adults, S$1 for Students and Senior Citizens (60 yrs old and above). It is free for Children below 12 yrs old. The Botanic Garden is open daily from 5am to midnight. The National Orchid Garden is open daily from 8.30am to 7pm.